“2 years ago today I went in to get a prenatal chiropractic adjustment. As I was driving to work I noticed that Ronin was really starting to move around and do what I called at the time: ‘a weird stretch’. I got to work and began welding but I was really tired and my back was killing me. I would have to stop every once and a while and sit down. My boss kept asking if I was ok and I told him I was just really starting to feel over pregnant. I finished out the day at work as usual and told my boss I would see him tomorrow. 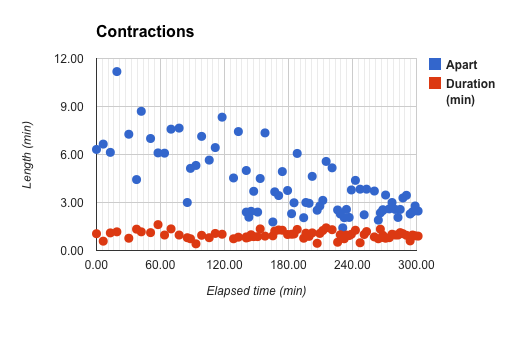 By midnight we were both sure I was in labor as the contractions were now 4 min apart. The data ranges from approximately 10pm on June 20th – 6am on June 21st. As you can see, everything started happening rather quickly. By 8am we were out the door, driving like mad. At 8:40am, you entered this crazy world. The data is impressive, and the graph beautiful. When I get home, I’m going to do the same.